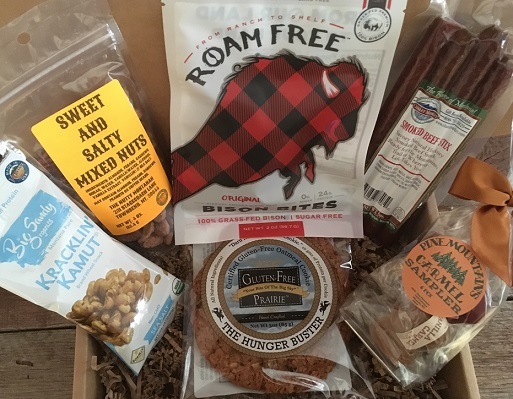 The Montana Snack Box is perfect for that food lover in your life! It includes: Smoked Beef Stixs from Chalet Market (Belgrade), Sweet and Salty Mixed Nuts from The Nutty Montanan (Townsend), 6-Piece Caramel Sampler from Pine Mountain Candies (Missoula), Kracklin’ Kamut® from Big Sandy Organics (Big Sandy), The Original Bison Bites from Roam Free (Flathead Valley), and The Hunger Buster Cookie from Gluten-Free Prairie (Manhattan). Yum! Yum! **This box is separate from the monthly subscription, and can be shipped anytime. We use USPS 1-3 priority mail, and generally ship your box 1-3 days after you place your order. Contact us if you have any special instructions!